played the last four seasons of his career in the WHA from 1974-78 with the Toronto Toros and Birmingham Bulls. The league folded in 1979. Thirty five years ago, the World Hockey Association embarked on its first season, lasting for just seven turbulent campaigns that produced a litany of legendary stories that have lingered long after the final horn sounded in 1979 when the Winnipeg Jets beat the Wayne Gretzky-led Edmonton Oilers in Game 6 of the league's final playoff game. Over the course of the seven seasons, the WHA had 27 franchises, including the Miami Screaming Eagles and teams in Dayton and San Francisco that never took to the ice. The league also invested heavily in players from Sweden, Finland and Czechoslovakia. Suffice it to say, the league had a brief, yet colorful, existence. You might think some of the WHA tales have been exaggerated over the years to the point where the movie Slap Shot look plausible. But they are indeed true. In fact, one of the stars of Slap Shot,, Dave Hanson, played Jack Hanson of the celluloid Charleston Chiefs of the Federal League. In real life, Hanson was the star of one of the stranger WHA stories, playing defense and forward with the Birmingham Bulls in 1977-78 just after Slap Shot was released. Hall of Famer Frank Mahovlich, who played with Stanley Cup championships teams in Toronto and Montreal, was in the Winnipeg Arena when the Bulls played the Jets the night Hanson got in a fight with Bobby Hull. Those in the building saw something that Nancy Dowd never scripted for Hanson in the movie. It seems Hanson pulled Hull's toupee off of his head during a melee. "He jumped up behind Bobby Hull and pulled Hull's wig off," said Mahovlich, who watched in disbelief. "And in those days, the wigs were sewn in, they were stitched into your head. And Bobby started to bleed from the top down and the blood was coming all over and he had to walk off the ice. It was an embarrassment in a lot of ways. That was one of the stories that happened. "It wasn't a pleasant thing. It happened so quick. I don't know what he was doing, he just did it." But that wasn't the end of the tale. In typical WHA fashion, there was a second part of the story which involved a Winnipeg fan and Steve Durbano after the game was done. "Then, after the game, I recall Ken Linseman, Steve Durbano and I were walking out from the rink and we were going back to the hotel and Durbano kicks this fellow that was voicing his opinion at him and a fight breaks out right outside our dressing room. "This isn’t Slap Shot,” Mahovlich recalls, “but get this, the fight breaks out. The fellow is a tough guy, but you don't know that when a fellow is in a shirt and tie. You don’t know whether he is tough or not. So the fellow puts Durbano down and our manager (coach Glen Sonmor) runs into the room and yells; ‘Durbano is getting the living hell beat out of him.’ Six guys come out of the dressing room with no clothes on, they were still in the shower, and we got 100 spectators there. We have six guys pulling this fellow off. It was really out of Slap Shot. It was better than Slap Shot. ”The Big M” never asked “The Golden Jet” about the fight with Hanson. Perhaps it is just as well. But it was the only time in WHA history that someone lost his wig in a fight. In Slap Shot, Chiefs radio announcer Jim Carr wore a bad wig and Chiefs star Ned Braden in an interview asked Carr; “Why do you wear that rug? It’s sensationally ugly!” But Braden never got the wig off Carr. The 1977-78 Bulls had a rogue’s gallery of tough guys. Durbano, Hanson, Gilles Bilodeau and Frank Beaton were ready for action every night. The Bulls had some talented players too, but the lasting legacy of the 1977-78 Bulls are the tough guys. "We had a fellow by the name of Frank ‘Never Been Beaten’ Beaton and he would throw 10 punches before you knew you were in a fight with him," Mahovlich said. "So it was pretty fast and you didn't know what was happening. Gilles Bilodeau, he was a huge man from northern Quebec. A real lumberjack. A nice person though. A nice, gentle person, but he was down there for one thing. The coach would send him over the boards for one thing and boy, he did this thing. I don't know if he ever won a fight, but he certainly got into a lot." Mahovlich had signed with the WHA's Toronto Toros in 1974 after a tremendous NHL career in which he scored 533 goals and 570 assists with the Maple Leafs, Red Wings and Canadiens. Mahovlich should have known that his WHA days would be very different from NHL tenure when he met Toros goaltender Gilles Gratton. Gratton was a definite free spirit and claimed that he was reincarnated and had once been a soldier in the Spanish Inquisition. Gratton occasionally complained about the injuries he suffered while being a soldier. The Toronto Toros were losing money and owner John Bassett moved the franchise to Birmingham in 1976. Mahovlich moved with the team to an area that had no hockey culture whatsoever. Mahovlich had been hockey royalty in Toronto and had four Stanley Cup rings with the Leafs. 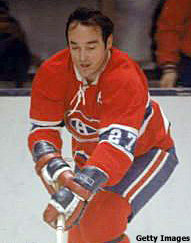 He also played with Gordie Howe and Alex Delvecchio on a line with Detroit and won two Cups as a member of the Canadiens. Suffice it to say, Birmingham was a long way away from the Forum, Maple Leaf Gardens and the Olympia. Mahovlich thought Houston and Winnipeg were good WHA teams that might have been respectable in the NHL. Houston had Gordie Howe, his sons, Mark and Marty, and some good talent like John Tonelli and Terry Ruskowski, while Winnipeg had Hull playing with Anders Hedberg and Ulf Nilsson along with defenseman Lars-Erik Sjoberg. The Hull-Nilsson-Hedberg trio was considered the best line in the WHA. Edmonton Oilers General Manager Glen Sather modeled his five time Stanley Cup championship teams in Edmonton after the Jets’ style of play. "They had a pretty good team, they had an NHL team," Mahovlich of Houston. "Winnipeg and Houston. They could play in the NHL in those days. They had solid teams." The Big M ended his career in 1978 with the Bulls and was elected to the Hockey Hall of Fame in 1981. Sonmor left to coach the Minnesota North Stars and would eventually lead Minnesota to the 1981 Stanley Cup Final, where the team lost to the New York Islanders in five games. The Bulls lasted one more season before folding, but the team left another legacy – “The Baby Bulls.” Bassett signed a number of underage junior players, including Rick Vaive, Michel Goulet, Rob Ramage, Craig Hartsburg, Louis Sleigher, Keith Crowder and Pat Riggin. All of those players skated for NHL teams. Birmingham and Cincinnati were consigned to history hockey in May 1979 after the NHL expanded to Edmonton, Hartford, Quebec and Winnipeg as part of a merger deal between the two leagues. Since then, Birmingham has had a few high- and low-level minor league teams. Presently the city does not have a professional team. Mahovlich has not been back in Birmingham since his contract ended with the Bulls in 1978. "It's been over 25 years, so the statute of limitations, you know, it's 25 years so I'm OK to go back."